Just as former Chief Minister Bansi Lal’s body was being taken inside his residence here this morning, a neighbour who stood leaning against a wall almost collapsed choked with emotion. A one-time friend and protege-turned political foe, former Chief Minister Banarsi Das Gupta took sometime to come to grips with the situation. Politicians of all hues have mourned the death of Mr Bansi Lal in Delhi yesterday. The authorities of Guru Jambeshwar University (GJU) here today suspended official as well as teaching work due to the death of former Haryana Chief Minister Bansi Lal. The university administration postponed the executive council and finance committee meetings scheduled to be held today. With a view to taking farm technology to the farmer, the authorities of Haryana Agricultural University (HAU) here organised a field day on wheat and barley crops at Kohli village, near here, yesterday. The Central Government has taken the Haryana Government to task for changing the eligibility criteria for appointment to posts of Secretary of Zila Sainik Boards. The Punjab and Haryana High Court today dismissed the petition filed by animal rights activist Naresh Kadyan, seeking cancellation of bail granted to former Indian cricket captain Mansur Ali Khan Pataudi and his associates in the case relating to killing of a black buck in June last year. If the farmers went on growing ‘Saathi’ variety of paddy, the land in this district will turn barren and the situation will be worst than the Rajasthan deserts . This was stated by Mr R.K. Khullar, Director, Agriculture, Haryana, while addressing farmers at a seminar at Guhla. A state-level convention of the federation of unrecognised schools welfare association was held here today. The District Agriculture Department seized a huge cache of spurious BT cotton seed from the premises of a seed manufacturing unit here today. The department has seized the seed and taken samples of the same. The president of the Haryana Pradesh Beopar Mandal, Mr Bajrang Dass Garg, on Monday demanded that the rates of value added tax should be rationalised. Haryana plans to bring about 79,000 hectares under kharif pulses as part of its programme to accelerate the diversification programme in the state. As he recovered his composure, he mumbled “God, he was so fortunate and yet so unfortunate”. Obviously referring to Bansi Lal’s meteoric rise in politics and then the untimely death of his son Surinder Singh in a chopper crash last year. Hours later, Mr Gupta recalled an incident that took place in the Chief Minister’s residence in Chandigarh years ago. “I had gone to meet him. In his camp office he had a map of Haryana on a wall. It had areas marked yellow and green. The green colour depicted areas with natural or canal irrigation. Yellow colour marked the areas which were deficient in water. Surprisingly, Bhiwani was included in the green part,” he recalled. Mr Gupta said he asked Bansi Lal why Bhiwani, an arid zone, was marked green. “Pat came the reply. I will make Bhiwani green. And he lived up to his words,” he reminisced. Elsewhere in Bhiwani residents shared their experiences about the departed leader throughout the day. Many received the news while on their morning walk which sent them scurrying to the former Chief Minister’s residence in Vijay Nagar. Inside the dead leader’s house the scene was poignant, yet dignified. His elder son Ranbir Singh Mahendra, MLA, and close relatives maintained their poise. A “shamiana” was hurriedly put up in the courtyard where the body was later kept for the people to pay last respects. Outside in the queue, an admirer broke down. Someone from behind the queue came forward and told him, “Tau rowey mat. Woh ek loh purush tha. Itne badde aadmi se yohi seekheya hai ke”. (Don’t cry uncle. He was an iron man. Is that all you learnt from the great man). The old man nodded in agreement, wiped his tears and then bowed before the leader’s body. As the day progressed, the house became crowded and VVIPs rubbed shoulders with the masses. But the most poignant moments came when the body was taken out for its last journey to Golagarh — Bansi Lal’s ancestral village. Women lost control and wept uncontrollably. Many close relatives who were maintaining their poise till then, also started sobbing. All along the 30 odd km-long drive to Golagrah, men, women and children lined up on both sides of the road. Most of them followed the motorcade to the cremation ground. After the cremation as the mourners began to depart, an elderly villager’s remarks in Haryanvi came as the ultimate tribute to the onetime hero of Haryana. Translated into English this is what he said, “Our Bansi is not dead. He lives in the roads, power houses and canals he gave us. So, don’t shout long live Bansi Lal. Instead say hail Bansi Lal”. In a condolence message, Mr Bhajan Lal, chief of the HPCC, said Mr Bansi Lal took over as the Chief Minister of Haryana when it was quite underdeveloped. The credit for providing electricity to villages, construction of rural roads and improvement of the irrigation facilities went to Mr Bansi Lal. “He launched Haryana on the path of all- round development”, the message said. He said the death was a personal loss to him. The President of the Indian National Lok Dal and former Chief Minister, Mr Om Prakash Chautala, also mourned Mr Bansi Lal's death and offered his heartfelt sympathies to the bereaved family. He said Mr Bansi Lal, by virtue of holding high public offices in the state and at the Centre, acquired deep insight into administrative matters. Mr Chautala added that as a mark of respect to the departed leader, all functions of the INLD had been suspended till April 1. Mr Sampat Singh, INLD leader and former Haryana Finance Minister, recalled the efforts made by Mr Bansi Lal to protect the interests of the state. There were a number of occasions when, ignoring political differences, he had extended his support to a common cause, he said. Mr Deepender Hooda, Lok Sabha member from Rohtak, said the contribution made by Mr Bansi Lal to the state and the country could never be forgotten. Mr Ram Parkash, working president of the HPCC, said in the death of Mr Bansi Lal, Haryana had lost a great son. Mr Bansi Lal's death was also mourned by Ms Renu S. Poswal, Chairperson of the Haryana State Social Welfare Board, and Mr Bajinder Thakur, national secretary of the Maharana Pratap Foundation. Ms Poswal recalled her father's association with the departed leader and said he was just like a father to her. Mr Krishan Pal Gurjar and Mr Rambilas Sharma, senior BJP leaders, also mourned Mr Bansi Lal's death. The Haryana Chief Parliamentary Secretary, Mr Dharambir, said in a condolence message that with the demise of Mr Bansi Lal an era had come to an end. He said Mr Bansi Lal had given a new dimension to the development of the state with the blessings of the then Prime Minister, Indira Gandhi. The Vice-Chancellor, Dr R.P. 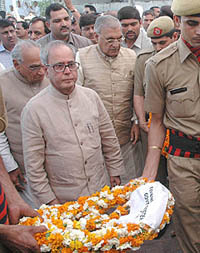 Bajpai, has expressed sympathies with the late leader’s family and paid tributes to the departed soul. Meanwhile, the District Congress Committee (DCC) also condoled the death of the former Chief Minister. At a condolence meeting held here, local Congress leaders, led by DCC (Urban) president Pankaj Mehta, observed a two-minute silence in memory of the departed leader. The Haryana Private College Non-Teaching Employees Union and several other social, political and other organisations expressed shock and grief over Bansi Lal’s death. Ambala: The Citizens’ Council today organised a condolence meeting for former Haryana Chief Minister, Bansi Lal. Dr N.C. Jain, chairman of the council, said that Bansi Lal had contributed for the overall development of Haryana. Members of the Dainik Yatri Sewa Sangh, Haryana, observed a two- minute silence as a mark of respect for the departed soul. Mr Mewa Singh, president of the sangh, said that Bansi Lal had contributed immensely for the growth of Haryana. The farmers of the village and nearby areas were shown the latest varieties of wheat and barley being raised in fields under the supervision of university scientists. The HAU Vice-Chancellor, Dr J.C. Katyal, presided over the function and also visited the demonstration plots of these crop varieties. He called upon the agricultural scientists of the university to concentrate more on developing new varieties of crops, which, apart from being resistant to insects and diseases, would give high yields of good quality at low costs. Dr Katyal urged the farmers to diversify agriculture, but added that before going in for diversification they must ensure the availability of marketing facilities and natural resources for the new crops they were planning to grow. The HAU Director of Research, Dr R.K. Malik, also underlined the need of diversification of agriculture. He advised the farmers to be in close contact with university scientists to avail of services and facilities rendered by the university for their welfare. The Dean of College of Agriculture, Dr S.S. Dahiya, appealed to the farmers to register maximum participation in the extension education programmes organised by the university. He also told the farmers present on the occasion about the conservation of natural resources like land and water. The head of the HAU Department of Plant Breeding and head of the wheat and barley section, Dr R.K. Rana, also addressed the gathering. On the occasion, competitions of crops and handicraft items prepared by rural women were also held and the Vice-Chancellor gave away the prizes to the winners. The university had also made arrangements for the sale of seeds of various kharif crops in collaboration with the HSDC. The Central Government has taken the Haryana Government to task for changing the eligibility criteria for appointment to posts of Secretary of Zila Sainik Boards. The change, which doubled the minimum stipulated age for the posts from 25 years to 50 years, has resulted in a large number of retired defence officers being ineligible for applying, even though they meet all other requirements. In a letter to the Chief Secretary earlier this month, the authorities at the Defence Ministry’s Kendriya Sainik Board have termed the state government’s move as “illogical and not in consonance with the policy of the Central Government on the subject, which provides for recruitment of officers with 5-15 years of service to the posts of Secretary, Zila Sainik Boards”. Meanwhile, the Punjab and Haryana High Court has restrained the state government from carrying out appointments to the said posts. The ministry’s letter states that such a decision has led to depriving opportunity to retired officers who seek the post as a second career. The letter further points out that as per the Central Government’s policy issued in April 1998, permanent commissioned officers with 15 years of service or short service officers with 5 - 10 years of service are eligible for the said posts. The raising of the minimum age of recruitment to 50 years would result in all such officers being rendered “underaged”. Since the Defence Ministry bears 50 per cent of the expenditure of the Haryana Sainik Board, the state department is obliged to follow the policy guidelines laid down by the Centre. Interestingly, the Central Government had also written to the state government in April 1998 concerning the aforementioned posts. In the letter, the Defence Ministry had stated that the release of the Central Government’s share of budgetary support was also liable to be withheld in case the laid down guidelines of the April 1998 letter were not followed. Mr Kadyan is chairman of the Haryana chapter of the People for Animals (PFA). Mr Pataudi and others were booked under the Wildlife Act following recovery of carcasses of a black buck and two rabbits from their vehicle on June 3 at Jhajjar. Pronouncing the judgement, Mr Justice Rajive Bhalla also directed that the hearing in the case against Mr Pataudi and others would now be conducted at the Faridabad-based Special Environment Court. Mr Pataudi, Mr Shashi Singh, Mr Shahid Ahmed, Mr Balwant Singh and Mr Dayal Singh were granted bail by the Chief Judicial Magistrate (CJM), Jhajjar. In his petition, Mr Kadyan claimed that the CJM did not have the authority to grant bail to them. He said only the Special Court at Faridabad could do so. The petition also said the Haryana Government had set up two special courts to deal with such offences that fell under the purview of the Wildlife Act. These courts are located at Faridabad and Kurukshetra. During the hearing, Mr Kadyan’s counsel had stated that according to the notification issued by the government in February 1997, the Jhajjar court had no jurisdiction either to grant bail to the accused or to hear the case. Sometime back, Mr Justice Bhalla had reserved his judgement on the issue. The High Court on Wednesday issued notice of motion for May 25 to the Haryana Government and others on a petition filed by Yamunanagar-based advocate Rameshwar Singh. In his petition, Mr Rameshwar Singh has prayed for directions to the respondents to register a case against the Superintendent of Police, Yamunanagar, for allegedly threatening him on March 17. The petitioner has claimed that he was summoned by the officer through Sub-Inspector Baljit Singh and told not to take up the case of one Pawan Kumar against Gulshan Vinayak. Vinayak, he has stated, is close to certain police officers. The petition alleges that Vinayak wanted to grab the house of Pawan Kumar and the petitioner had been approached to handle the case. The writ also seeks an independent inquiry into the matter. He appealed to the farmers not to plant Saathi paddy in April- May months as it consumed a lot of water and it adversely affected the underground water resources. He said that according to agricultural scientists, 4500 litre water was needed to produce 1 kg rice from early variety paddy because due to dry weather and lack of moisture in this season the water in the fields evaporated speedily. In comparison, only 1500 litre water was needed to produce 1 kg rice if the paddy was planted after June. He cautioned the farmers against planting early varieties of paddy keeping in view the depleting water table in the district. He said that early sown varieties were also prone to diseases which ultimately increased the cost of production to the farmers as they have to use pesticides and insecticides to control the diseases in this crop . The local MLA and Parliamentary Secretary, Mr Dillu Ram, advised farmers to grow ‘Dhancha’ and use it as green manure to increase the soil fertility. He said that farmers should sow other crops in this season to augment their resources of income. Mr B.S. Malik, Deputy Commissioner, who presided over the seminar said that a number of times early variety paddy suffered from untimely rains which caused huge financial losses to the farmers. Dr Dharam Singh, Dr Dalel Singh, Dr Khushi Ram, scientists from Rice Institute, Kaul, and Dr R K. Sheokand of Krishi Vigyan Kendar, Kaithal, Mr Kushal Paul Sirohi, President Kisan Club, and Mr Mahaveer Singh, Deputy Director, Agriculture, Kaithal, also addressed farmers in this seminar. Haryana Education Minister Phool Chand Mullana, who was the chief guest, said a committee had been formed to look into the issue of unrecognised schools and the government would act only after the recommendation of the committee was received. Mr Mullana said Education Rules 2003, which were for either upgrading or closing unrecognised schools, were framed during the Chautala regime. Mr Kulbhushan Sharma, president of the federation, said there were 20,000 unrecognised schools in the state, where 2 lakh teachers were employed and 30 lakh students were being imparted education. He observed that the government had been saying the schools contributed to the ‘Sarv Shiksha Abhiyan’, but was yet to take a favourable view of the matter. He demanded that students of unrecognised schools be granted permission to appear in board examinations as private students. A team of the Agriculture Department led by the Deputy Director, Agriculture, Mr R.C. Poonia, raided a seed factory, Sunseed India, after a tip-off and seized 15.35 quintals of spurious BT cotton seed. The cotton seed, which was stocked in 24 bags, was being filled in pouches. The department has also recovered a large number of empty pouches from the factory. The Quality Control Inspector accompanying the team has taken samples of the seed. Mr Poonia informed media persons that the owner of the factory had admitted to have brought 35 quintals of cotton seed from Gujarat. He used to sell it in Haryana and Punjab by filling it in pouches under his own brand, “Sher-e-Punjab Gold”. He said the manufacturer did not have any stock register or bills of the consignment. He said that the dealer had been found contravening the provisions of the Seed Act, 1966, and would be accordingly proceeded against. The president of the Haryana Pradesh Beopar Mandal, Mr Bajrang Dass Garg, on Monday demanded that the rates of value added tax (VAT) should be rationalised. In a statement issued here, Mr Garg, who is also the Chairman of Confed, said several items, which were being taxed at the rate of 12.5 per cent, should be brought in the tax slab of 4 per cent. He said several states, while implementing the VAT regime, had unilaterally changed the tax rates against the recommendations of the Empowered Committee of the Finance Ministers of the states. Mr Garg said a delegation of the mandal would soon meet the Union Finance Minister, Mr P. Chidambaram, to press its demand for the rationalisation of the VAT rates. A meeting of the traders of northern Indian would also be soon convened here to discuss the strategy to be adopted in this regard. He said the mandal had launched a campaign to know the problems being faced by traders and get these solved by taking these with the government. Stating this the Haryana Agriculture Minister, Mr Harmohinder Singh Chatha, said a target of bringing about 12,500 hectares under kharif oilseeds in the paddy-wheat growing areas had been also set. He said an all-time high target had also been fixed for bringing 8.35 lakh hectares under rabi oilseeds. The district police has recovered the mobile phone allegedly used by a gangster lodged at the Karnal jail for demanding Rs 50 lakh as extortion money from a local businessman.